As the weather has been fairly windy and overcast I haven’t had much of a chance for a dip lately. But I have always heard that Giles Bath (Coogee Rock Pool) is perfect on windy days and for beginners as it is well sheltered from the surf, so I thought it was worth a look. I wasn’t in for long so this will just be a shortie. 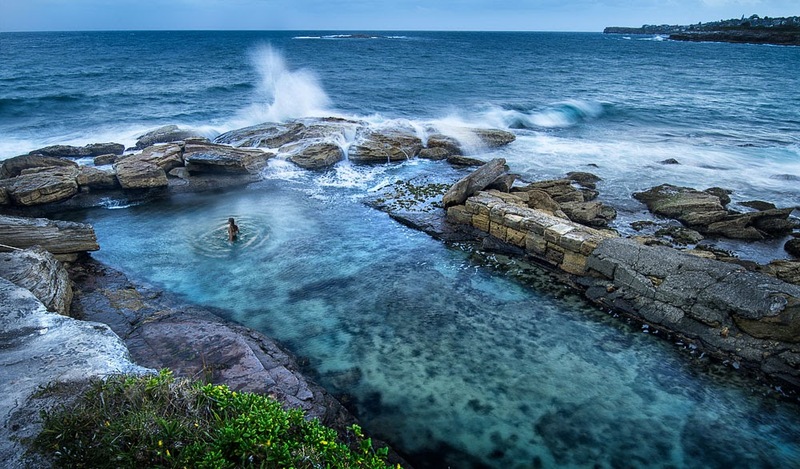 Located at the North end of Coogee, this little natural rock pool can be accessed at low tide via the rocky foreshore, or at high from the Coastal Walkway in Dunningham Reserve, the entrance stands near the memorial for the Bali bombing attack. As the water is so shallow and protected from the waves it makes for a perfect habitat for the little guys and a huge array of colourful coral. Found some White Striped Anemone. They use their tentacles to pull in small fish but also have the added defence of stinging cells they can shoot out from near their base when needed. My photos don’t do it justice as they were too quick for me but there were plenty of tropical fish about. An Indo-Pacific Sergeant - easy to identify from its 5 vertical black bars, and its head's yellowish hue.